Super Attorney Alan Gura, the Lead Lawyer for the Second Amendment Foundation, did not attend this year’s Gun Rights Policy Conference held in Orlando, FL. However, he did record a speech for the event that gives the gun community a brief but detailed status report on the SAF’s many ongoing legal battles, most notably, the fight to get the Supreme Court to rule on whether the Second Amendment extends beyond the home. If you’re unfamiliar with Mr. Gura’s work, shame on you! Just kidding. But you should know who he is. I called him a “super attorney” for a reason. 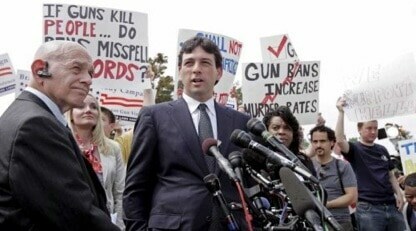 Mr. Gura was the one who argued the landmark Heller case before the High Court (which struck down the D.C. handgun ban and explicated that self-defense within the home is covered under the 2nd Amendment) and represented the SAF in the Supreme Court victory in McDonald v. Chicago (which extended the Heller ruling to the states). As we all know, there are “advocates” within the firearms and ammunition industry that talk a good game but when it comes time to actually do something, they disappear, and then there are the real professionals who get stuff done, Mr. Gura definitely falls into the latter category. He gets stuff – the important stuff that’s critical to the preservation of our right to keep and bear arms – done. Consequently, Mr. Gura expects the High Court to answer this question “in the near future.” Maybe in 2013, maybe. Mr. Gura ends his speech with a very important point, the need for the pro-gun public to stay politically active. We need to demand that our lawmakers and more specifically our judges, “are committed to enforcing the whole Constitution whether they personally agree with it or not,” said Gura. Indeed. The battle rages on. Thankfully, we have someone as competent and as intelligent as Mr. Gura at the helm. Let’s hope that 2013 turns out to be another great year for gun owners.